Although South Korea has so many great healthy foods this deep fried dish sounded so interesting and looked too pretty to resist. Sweet potatoes are pre-baked, deep fried and then dipped in a almond syrup before getting a sprinkling of black sesame seeds. These are great if you have a major sweet tooth. I also made a variation with a french fry shape that just got a very light drizzle of syrup and a fair amount of salt sprinkled on top. Sweet and savory, this preparation was my far my preference of the two. I used the sweet potatoes that I found at the Asian market; it wasn’t until I peeled them that I realized they weren’t orange inside. Feel free to use your favorite sweet potato variety- a purple Okinawan sweet potato would also look pretty with this preparation. Preheat the oven to 400 degrees. Cut the sweet potatoes into bitesize slices or strips shaped like french fries. Soak them in a large bowl full of water to remove some of the starch. Drain and place on a baking sheet. Bake for 10-15 minutes, until the sweet potato has softened slightly but is not cooked through. Combine the light brown sugar and water in a small saucepan and simmer over medium heat until a semi-thick syrup has formed. Remove from heat and add the crushed almonds. Heat several inches of vegetable oil to 350 degrees in a small heavy bottomed saucepan and, in batches, fry sweet potatoes for several minutes until golden. Drain on a paper towel lined plate. Place on a serving plate, drizzle with the almond syrup and sprinkle with black sesame seeds and salt. Note: If you’d like the super sweet variation, double the amount of syrup (use 1/2 cup each of brown sugar and water and use four crushed almonds). 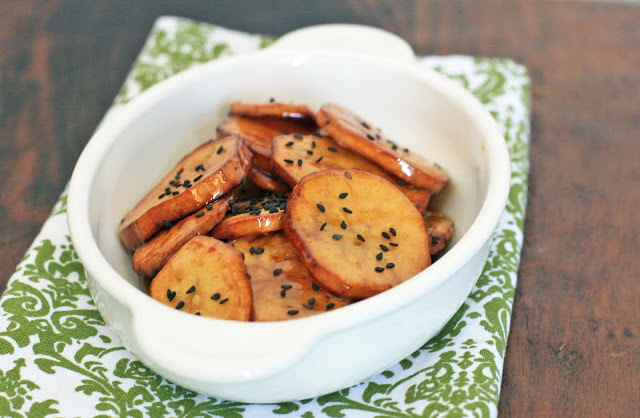 Dip each piece of sweet potato in the syrup before sprinkling with sesame seeds. Use little to no salt for this variation.